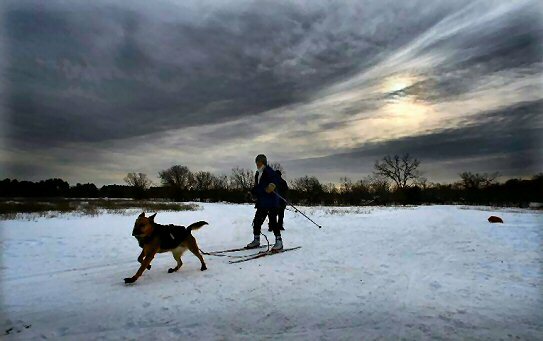 Skijoring is a winter sport which combines cross-country Skiing with dog power. The SKIER SKIS while the DOG PULLS and takes voice commands.The skier is attached to their dog with a belt and towline and skis while the dog pulls in a sleddog/skijor harness. Skijoring is a sport which allows both human and canine counterparts contribute to the endeavor and enjoy the exercise in the great outdoors. Skijoring has been around for hundreds of years. Probably reinvented in every culture that had snow and draft animals. 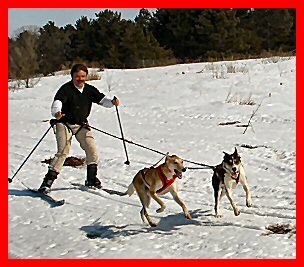 The word is derived from the Norwegian word hundekjoring which means dog driving. . The sport of hundekjoring (including sled and pulks) has deep roots in Scandinavian military and in ski patrol ambulance/rescue services (hence their early acceptance on ski trails) . Eventually skijoring made its way to other countries, including the United States, where today it is used as a means of recreation and competition. The majority of skijorers are RECREATIONAL.. They like to get outside with their dogs to enjoy the relaxation of a peaceful trail winding through the beautiful outdoors. Often a group will get together at one of the local skijor trails for a fun-run or a low pressure training session. 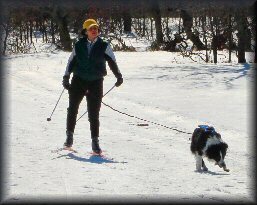 Recreational skijorers are more about enjoying the trail along the way with help from their canine friend than getting to the end of the trail quickly, although many recreational skijorers participate in Novice or Sport skijor races. These types of races (rec/sport and novice) are a fun way to get together with other skijorers and enjoy the spirit of the race without the pressure of competing with trained Pro racers. Some events may even offer a Non-Jor-tour or a Ski-WYD ("ski with your dog") classification. NOTE: Since all participant levels may be on the same trail at the same time they are all are expected to be on the same page. SO Be sure to know and follow race rules, procedures, etiquette and protocol before entering any event. (See "Skijor race rules and guidelines" in OUR events page) it is also under files in the Midwest Skijorers Facebook group. Competitive skijorers, on the other hand, diligently train themselves and their dog for strength, endurance, speed, and proper technique in order to always maintain a "snug tug" and to get to the finish line as quickly as possible. Many many hours are spent training their skijor dogs to confidently execute commands to near perfection, to pass flawlessly, to be fully prepared mentally and physically for all stress and stimuli of a race environment, as well as to exercise and condition themselves and their dogs so both are in tip-top physical shape. They log several hundred miles each fall and winter before the 1st skijor race of the season. They strive to themselves be thoroughly informed on IFSS rules, policies, procedures, etiquette, and protocol to be responsible dog drivers. We can help with that, we have created the Competitive Dog Powered Sports Education Program. If you are interested in racing(skijor, pulka, combined or sled) or in improving your race performance you should definitely attend our advanced training sessions, our NEW "DOG DRIVER EDUCATION" programs, and join the club to have access to valuable in-depth information in the members' only forum. BACK COUNTRY SKIJORING, or distance skijoring is the practice of "getting away from it all". Skijorers hit the trails, mainly ungroomed, with their dog using back-country ski's and generally a sled to carry their overnight gear. Often back country skijorers head to the boundary waters for a weekend of fishing and camping. Others head north to enjoy a Yurt-to-Yurt skijoring experience. Backcountry skijoring is a different, refreshing, and rewarding experience beyond the norm of groomed urban skijoring trails. Most dogs of medium size (30 pounds and up) will be able to skijor if trained properly. (We can help, we are your dogs' advocate.) If you can cross-country ski (or are willing to learn) you are a good candidate for the fun sport of skijoring. Our club offers skijor presentations and training clinics throughout the year for all levels from beginner to elite. Equipment, commands, etiquette, training tips, and techniques are covered in our Skijor 101 presentation. Races, fun runs, training classes and presentation schedules are generally list on the home page and or the events page. Our Yahoo group is a friendly unbiased non-commercial group where you will be able to search our archives for information and join in online skijoring discussions. The skijor yahoogroup at: http://groups.yahoo.com/group/SKIJOR/ has ~400 photos (with informational text) on many aspects of dog powered sports. available for your viewing pleasure. Click here to join. Our training page contains numerous tips and training techniques to get you and your dog off to a positive start on your way to skijoring fun. We can only do so much as an introduction online here, so we highly encourage you to take our excellent training, join the club, and use our "MEMBER FORUM" in the "Member area" of this website which has in-depth discussions on all things skijoring as well as other dog powered sports.